We strive to become partners in our customers’ success by providing consistent high quality on a timely basis at a fair price. It's not just that our envelopes look good; it's that they perform as they are intended to function. Our envelopes fold perfectly, the glue sticks, paper is evenly coloured, patches properly glued and ink laydown always consistent. If you are looking for trouble-free envelopes that look good and are priced right, then your search ends at us. Rush Service is our expertise, we know your need for speed. We excel in quick turnaround of converting of your custom envelopes. At Basant Envelopes-N-Print Ltd. our promise to deliver on time is kept. It doesn’t matter how many or what size or how often you order. Your needs are our top priority. Our company can provide a high impact quality envelope at a competitive price and when you need it. One judges the value of an envelope company with the value of its relationship. We have always built our business on superior customer service and our goal is to provide you with the best experience possible. We have forged a multitude of long-term relationships with our customers and vendors. We have tremendous versatility and flexibility in finding the best solution while remaining price sensitive. Our expertise means time and cost savings for you. We know it takes hard work to keep a customer and we thrive to build a long-term, mutually beneficial working relationship with our clients and vendors. Above all these, we look forward to being the GO TO company you rely on for all your Envelope and Printing needs. One Stop Shop – Any Envelope, any quantity, any size. From standard plain white envelopes to complex bespoke envelopes made to specific requirements. Exclusively a specialist envelope manufacturer - This allows us to offer new levels of customisation and flexibility in its products and services. Located in Mumbai – Financial capital of India and a major export hub - This enables quick deliveries with short lead times for exports to Middle-East, Europe and Africa. 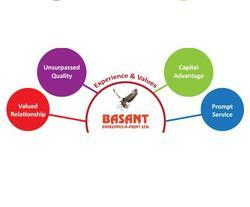 This is what Basant Envelopes-N-Print Ltd. stands for and this is what puts us in a league of our own."